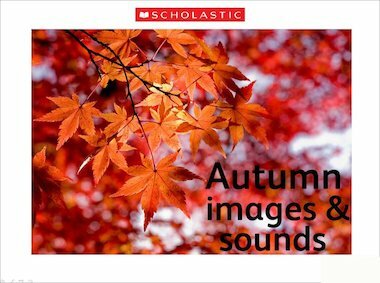 This slideshow features autumnal images and sounds, perfect for inspiring creative writing. I had a version of this that I downloaded a few years ago but the sound stopped working. Now I can’t seem to download it all from the website. It just keeps bringing me back to the resource screen with the 2 options for downloading. It’s a shame because as I remember it it would be perfect for hooking us into some Autumn poem writing, and I can’t find anything as good elsewhere. For anyone experiencing problems with the sound, if you have Office 2010 the 9 MB download version above should have working sounds on the final screen. Please do let me know if there are any other problems with this version and we’ll try to fix them! Great images but the sound buttons don’t work! Lovely images but the sounds don’t appear to be working. My sounds also don’t play! Could you check it is working? Otherwise it would be wonderful! That’s great you’ve found this resource useful. Adding the sounds to the slides is a wonderful idea. If you click on the speaker icon on four of the slides and the last page of the slideshow you should be able to play the sounds. Let us know if you’re still having problems. Pictures are beautiful. Pity that sounds don’t occur when click on each slide. As it is I don’t seem to be able to get any sound at all.